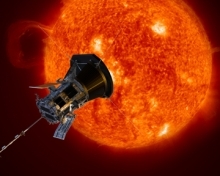 Seth Mayo, curator of astronomy for the Museum of Arts & Sciences, will share information about the Parker Solar Probe’s journey to the sun during two free programs in February. He will speak at 2 p.m. Friday, Feb. 1, at the Port Orange Regional Library, 1005 City Center Circle; and 2 p.m. Monday, Feb. 18, at the New Smyrna Beach Regional Library, 1001 S. Dixie Freeway. The NASA spacecraft, which began its seven-year mission in August, will travel through the Sun’s atmosphere, closer to the surface than any spacecraft before it, facing brutal heat and radiation conditions – and ultimately providing humans with the closest-ever observations of a star. Registration is not required. For more information, call the Port Orange library at 386-322-5152, option 4; or the New Smyrna Beach library at 386-424-2910, option 4. The presentations are part of the Volusia County Public Library's NEA Big Read, a six-week celebration of “A Wizard of Earthsea,” a 1968 fantasy novel by Ursula K. Le Guin. The NEA Big Read is a program of the National Endowment for the Arts in partnership with Arts Midwest.